I started preliminary planning for the electrical system after applying the top skin of the Strakes to their respective T-hats. I have more work to do in Ch 21 Strakes but the electrical system is not simple, and I've not done electrical wiring at this complexity before, so early planning and consideration of what will be needed seemed appropriate. Not sure yet on the COM/NAV/GPS/ADSB/Trans/Intercom... (actually lots to learn in this area). I'm planing to equip my Cozy for day/night VFR to start, and grow it to IFR as my fight skills and need develops. This way, I get flying sooner. I won't be flying IFR in the early days with the Cozy anyway. As I develop IFR skills and need, the equipment will evolve, and I'll purchase what makes sense at the time to transition to IFR flight. I will also plan for an autopilot, but I'm not sure if I'll implement the autopilot before completing my phase I flight testing for similar reasons. I'll make sure I have the capacity for these upgrades and they will be part of my continued enjoyment of building after I am flying. More to come here, I just wanted to go ahead and get this page "up" so I've got an easy place to put things as they develop. I also want to recognize some great input I've gotten from Neal Johnson who's configured his MKIV instrument panel/VP-X in much the same way I'm planning, and he's flying now. Decided (unless something drastic happens in budget) that I'll use the Dynon Skyview system. I still have to complete purchasing. I'm keeping the grips simple with only a push-to-talk button. I've mounted a hat switch on the center console forward of the throttle for pitch roll trim input, along with the landing brake switch (up)-off-(down), and the nose gear switches along with their 10A circuit breaker. VP-X on a glassed in shelf - I got this shelf idea from Neal Johnson. Ground connections available on F-28 and 6awg lines run from Master switched buss to VP-X and firewall ground to IP ground. After 3 years of hand connecting partially completed Molex connectors using the original wiring diagram and a bird's nest of wires, I'm finally ready to cut and organize the wiring and make the connectors with real pins inserted throughout. What put me in a position where I thought I was ready? Batter, master switch, and associated 6 awg leads now bring 12V to the actual tap points I'm going to use to power the nose gear. nose area is painted inside so I don't have to worry about masking or moving the bird's nest around any more. I kept the bird's nest inside a plastic bag to prevent contamination with dust and make it easy to move around without handling the wires and making a bigger mess. 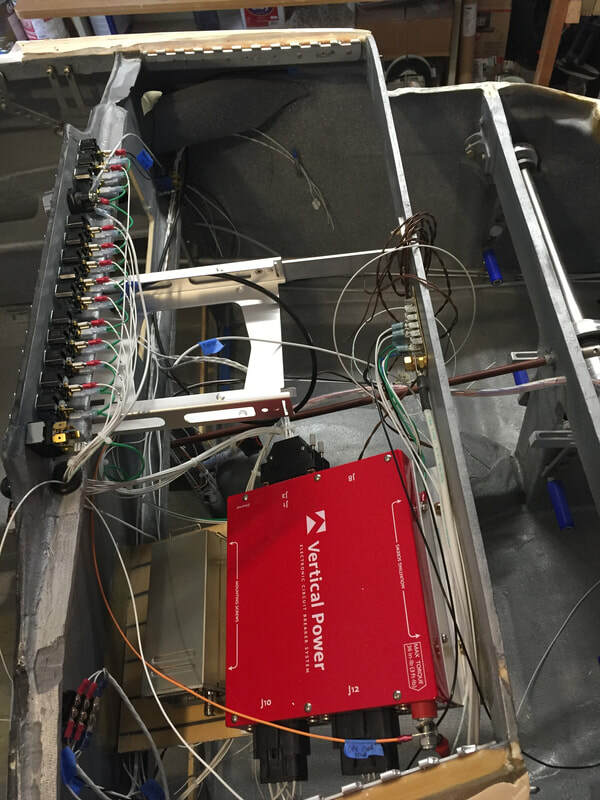 Note that I don't have the Automatic Extension Board for this system, but will implement something eventually, following notes by Marc Zeitlin on use of ranging sensor to measure AGL along with throttle position. With careful study of the wiring diagram AGAIN and making my own color coded connection diagram to match the actual wire colors delivered with the landing gear actuator, I figured out the routing from power, ground, and the switches to the Molex's (P1 and P2 for those using the eznoselift.com system). Once I had the Molex positions where I wanted them, I detangled the harness, wrapped in in spiral protection and passed it from the console to the actuator. Because I'm using hanging brake pedals and didn't want to interfere with their motion, I drilled a <3/8" hole in F22 as shown to pass the harness through (again using the spiral protection). After crimping and insetting the pins, photo to right shows what it looks like. I may further secure the Molex later and seal them up, but they are snug and not touching anything now. I then tested the system from the battery, and it works great in both directions from the switch panel. Yea, hopefully I won't have to mess with these wires again. Working in this area in late Jan early Feb 2018. Following the VPX install guide and running the configurator to assign circuits and switches to the various internal circuit protection systems. I ordered the "harness" but that just means they send you all the raw materials to make the VPX connectors. You still custom make the harness. I guess the main savings in time was that all the wire I needed to put into the higher power connectors (not D-sub) were taken from pre-crimped wire they provided in the "harness kit". If you don't mind crimping these yourself, and know what wire you want, you can save some $. For me the latter was a just as much a benefit, since I hadn't really documented every single wire size and length. Using their wire sets saved me from having to figure all this out. Here's a quick pic after getting all the connectors made, and running wires to the various places where loads are. You can't easily test the load switching with a voltmeter because there are voltages on the load lines even when they are off (if the VPX is powered up). Read about this. It has to do with solid state nature of the VPX. However, it's easy to make an LED load tester and put it on each circuit and flip the respective switches and make sure everything works as planned. Not difficult. I've got 3 warning lights above the EFIS and one warning light at the fuel pump selection switch. I'll get more information on the implementation of logic for these lights later when I've completed this work, but they rely on sensing various things, so I'll start with some documentation of these sensor installations. The first microswitch I installed was the switch near the actuator behind the front seats. It's a simple push type switch and I used the version with a long switch lever arm so I could keep the switch back away from the opening and the actuator. 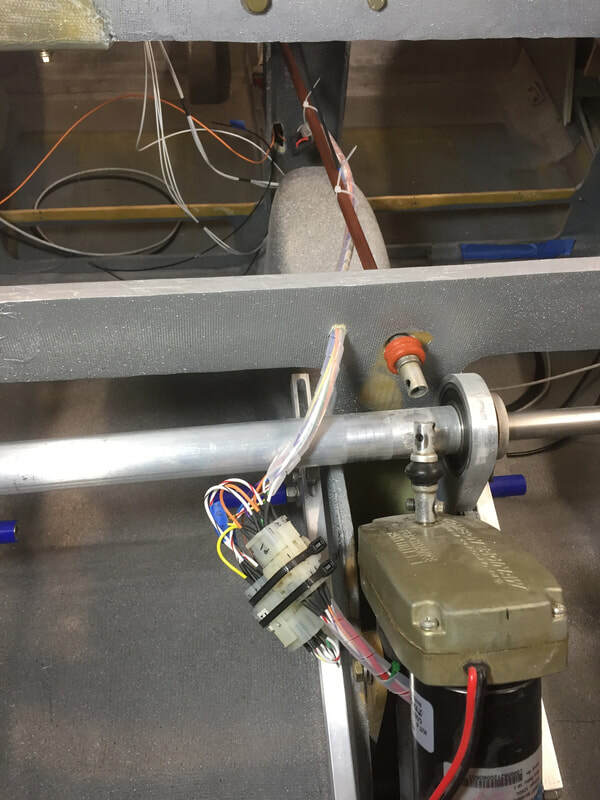 The pole that pushes on this lever arm was made with a threaded stud and a short section of 1/4" Al tubing we use for venting the fuel tanks. I tapped the inside of the tube so it threads onto the stud to get the height right, then bonded the stud to the speed brake flap. I then bonded the actual switch to some left over glass/PVC foam sandwich from armrest construction and marked where it needed to be to switch on when the speed brake is all the way UP. Then drop the brake and bonded it to the seat back support as shown in the figure.